Over the past 40 years, China’s reform and opening-up has led to leapfrogging economic development and the expansion of the country’s role at the regional and global levels, as shown by the close economic ties with its neighbours. While these achievements have become the bedrock for further development, China still needs to tackle several challenges to ensure a steady and sustainable growth path toward a modern industrialized economy. At the same time, neighbouring countries also need to understand the implications of China’s increasing economic weight and linkages with the region so that both sides can better benefit from growing economic ties and strengthening cooperation. 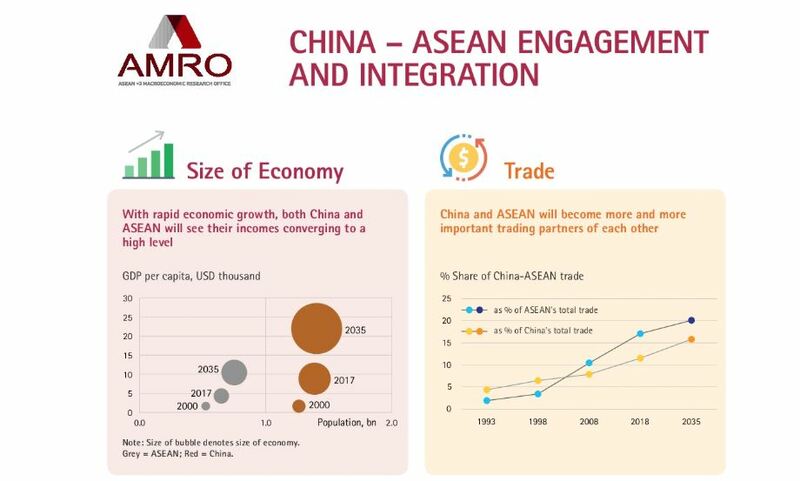 In this context, the ASEAN+3 Macroeconomic Research Office (AMRO), as the macroeconomic surveillance organization for the region, conducted a study titled “China’s Reform and Opening-up: Experiences, Prospects and Implications for ASEAN,” which was launched in Beijing in late October 2018. The seminar, co-organized by AMRO and the ISEAS-Yusof Ishak Institute, will use AMRO’s study as a background document and discuss the following questions: What are the key reforms and achievements in the past four decades and what are the unique characteristics of these reforms? What are the challenges and opportunities facing China moving forward? How have China and ASEAN benefited from deeper integration throughout China’s developments? How can both China and ASEAN better benefit from the growing economic ties and strengthening cooperation? For registration, please fill in this form and email to iseasevents3@iseas.edu.sg by 3 December 2018. Hoe Ee Khor is the Chief Economist of AMRO responsible for overseeing and developing the work on macroeconomic and financial market surveillance on East Asia and on the member economies in the region. He is also a member of the senior management team responsible for setting the strategic direction and management of AMRO. Prior to joining AMRO, Dr Khor was a Deputy Director of the Asia and Pacific Department (APD) at the International Monetary Fund (IMF), responsible for overseeing the surveillance work on six ASEAN and twelve Pacific Island countries. Dr Khor started his career as an economist at the IMF in 1981 and had worked on a wide range of economies in the Western Hemisphere as well as in the Asia and Pacific departments. He was the IMF Deputy Resident Representative in China from 1991-1993. Dr Khor obtained his Bachelor’s Degree in Economics/Mathematics from the University of Rochester and a Ph.D. in Economics from Princeton University. Chaipat Poonpatpibul joined the ASEAN+3 Macroeconomic Research Office (AMRO) in November 2013. His responsibilities include conducting country macroeconomic assessments, producing research works related to macroeconomic and financial stability as well as providing in-house training programs. Dr Poonpatpibul has varied expertise in macroeconomics, policy analysis and research as well as international cooperation from working in various capacities at a central bank as well as international financial institutions. Dr Poonpatpibul completed his Ph.D. in Economics at the University of Pennsylvania. He also holds a master’s degree from the University of Cambridge and a bachelor’s degree (first-class honours) from Chulalongkorn University in Thailand. Jørgen Ørstrom Møller is a seasoned diplomat, having served as State-Secretary 1989-1997 in the Royal Danish Foreign Ministry and from 1997 to 2005 as Denmark‘s Ambassador in Asia, Australia and New Zealand. In 2005, Mr Moeller joined the ISEAS – Yusof Ishak Institute as Visiting Senior Fellow and the MFA Diplomatic Academy as Senior Fellow. He is an Adjunct Professor, Copenhagen Business School and Singapore Management University (SMU). His recent publications in English are: The Veil of Circumstance, Technology, Values, Dehumanization and the Future of Economics and Politics (ISEAS 2016); The Global Economy in Transition: Debt and Resource Scarcities (World Scientific 2013); and How Asia Can Shape the World (ISEAS 2011). Lye Liang Fook is Senior Fellow with the Regional Security and Political Studies Programme and co-Coordinator of the Vietnam Studies Programme at the ISEAS – Yusof Ishak Institute. He was previously Research Fellow and Assistant Director at the East Asian Institute, National University of Singapore, where he also managed the Singapore Secretariat of the Network of East Asian Think Tanks (NEAT) and the Network of ASEAN-China Think Tanks (NACT), Track II bodies that promote regional cooperation. Mr Lye’s research interests cover China’s foreign policy orientation, China’s Belt and Road Initiative, China-Vietnam relations, China-Singapore relations and China-ASEAN relations. He was part of a government-commissioned team that completed a review of the Suzhou Industrial Park, the first flagship project between China and Singapore. His research extends into other government-to-government projects between the two countries such as the Sino-Singapore Tianjin Eco-city and the China-Singapore (Chongqing) Demonstration Initiative on Strategic Connectivity.